Today, I will introduce a popular brand District Made® for ladies. First of all, District Made® Ladies Drapey Dolman Tee is the example. It is made of 70/30 poly/rayon, 40 singles and it weighs 3.9-ounce. This tee is made to put you into cool look in summer. It features high-low hem and you will like it. Designed with a relaxed fit, this dolman tee will be a favorite. 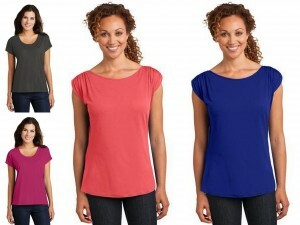 If you would like to be more fashionable, you can try District Made Ladies Modal Blend Gathered Shoulder Tee. It is features 60/40 ring spun combed cotton/modal and it features a gathered shoulder detail and 40 singles. It will not let you down in all aspects. There are four colors for you to choose. Dressing yourself up in style with these ones. Are you looking for a nice tank? The answer is District Made® Ladies Shimmer Loop Back Tank. A touch of shimmer and a unique loop back infuse this essential with glam. It is made of 60/40 ring spun cotton/poly. It’s suitable for any casual situation. When the days are getting cool, you can also wear a jacket. There are Black and Bright Coral for you to choose. You have another choice,too. A modal tank is a nice option. 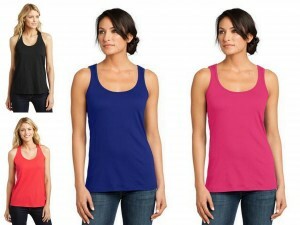 District Made™ Ladies Modal Blend Tank will be your best friend. It weighs 3.5-ounce and it is made of 60/40 ring spun combed cotton/modal. It features 40 singles. Designed to flatter and it is a layerable tank. An array of colors are available for your selection according to your preference. Recruit this tank for extra cool. When the days are getting cool, you can give yourself a long sleeve tee. District Made® Ladies Drapey Long Sleeve Tee is made of 70/30 poly/rayon, 40 singles. Relaxed fit, dropped shoulders make this tee comfortable and durable. Flowy and soft, this tee complements any look. There comes four colors and you can choose one freely. What will perfectly put a smile on your face? The answer is District Made® Ladies Tri-Blend Lace 3/4-Sleeve Tee. It is made of 50/38/12 poly/ring spun combed cotton/rayon, 30 singles. It weighs 4.4-ounce. It features 80/20 cotton/poly lace insets. Tri-Blend fabric infuses each apparel with unique character. Please allow for slight colors variations. You will never imagine how soft it will be to wear it and you will never be regret after you bought it. Now you can tell me what do you like best in the comments.